I’ll admit it. Before being asked to review the new installment of Telltale Games’ episodic series set in the world of The Walking Dead… I had basically written off the concept, overall. The original games didn’t really hold my interest. I am a big fan of the show, but never read the graphic novels. Instead, I’ve spent a lot of time exploring specific story-points in them and looking in detail at the art. For someone who has an engrossing and overall fandom for TWD, that first series was likely just fine. For me, it needed more. 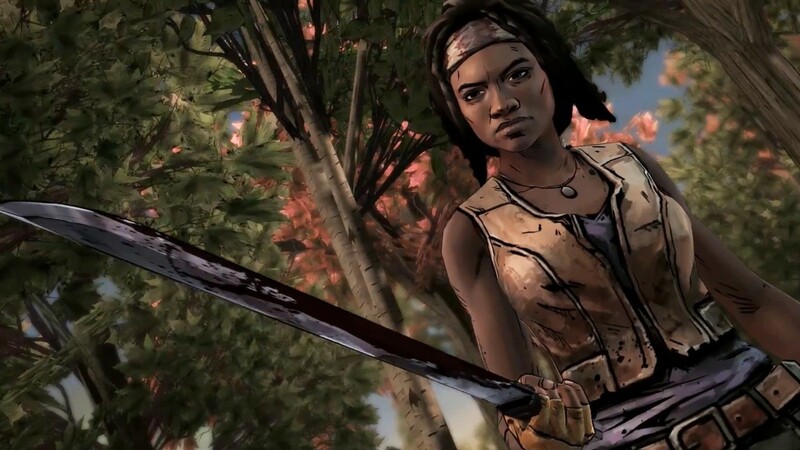 How about more, as in a favorite main character, such as Michonne? OK, now you’ve got a deal. The wisdom of Telltale’s newest approach is the presence of a main character as the player’s character and the promise of a prequel storyline. With that, a more casual fan may approach the game with a lot more familiarity and a temptation to “stay tuned” for the season. The game is currently set to run in three episodes, the first of which — In Too Deep — is available now. The art is on point in this game, as are the story and the characterization of Michonne, herself. A drawback; however, is the “episode” format, which makes for a good cliffhanger and ensures a revenue stream, but seems to be something that renders a “dry spell” between releases. If I were a game publisher, the potential for lost momentum would concern me. Presumably, this has proven to be a non-issue from a business sense, as this model is alive and well in modern gaming. Objectivity, in this case, is tough. Telltale chose an excellent moment to end In Too Deep, which drove me a little crazy. As soon as I’d gained a groove, we’re cutting to credits. The length of the episode felt a bit short, from an audience perspective, really. I still don’t know that I get the appeal of the control-interaction on these games. When the button-mashing sequence is complex enough, and you fail, you get to start right back up and attempt it again. There is a passiveness that feels a little disconnected. As more episodes come along, it will be great to see where this story goes. A replay with difference choices might be in order as well, to fill the gaps and experiment with various outcomes. With that, these games have a strength. They can be altered in ways other formats cannot. If you have not ventured into these games yet, do so. The risk is light to try it out — in time and cost. If you’re already a fan, add this to your gaming sessions and experience the Apocalypse as a main character. Telltale is definitely on track with this spin on the concept. Perhaps we can get a villain version?